As the leaves fall off the trees, covering the frosty ground with the colorful crispy blanket, I feel like my wardrobe needs an urgent upgrade, according to the latest fashion trends. This autumn season I drew my fashion inspiration from the Coach's fall/winter 2018 collection, that was influenced by the American Gothic style, witchcraft aesthetic and autumn forest charm. Therefore, I want and hope to fill my closet shelves with pieces, which closely resemble this enchanting style. From faux fur, leather fringe and silver accessories to flowing feminine fabrics, ruffles and sophisticated floral prints. I'm in love with every small detail and can't wait to incorporate these fashion trends in my autumn wardrobe. 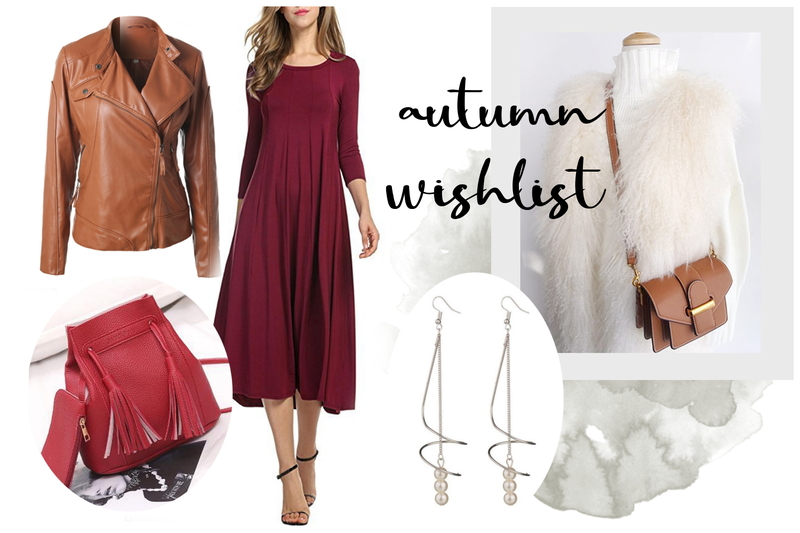 Ladies and gentlemen, today with a help of fashion store FashionMia, I have gathered my favorite pieces in one huge autumn fashion wishlist. Without further ado, let's start planning out autumn fashion wardrobe. I want to begin with the accessories. Coach 1941 collection featured fine silver necklaces, lightweight gauze scarfs, leather bracelets and handbags, decorated with long fringe. I love the combination of fine jewelry, loose silhouette and sheer materials. Just because the weather is getting colder, it doesn't mean we should stop wearing dresses, right?Autumn 2018 runway shows have inspired me to try out a long, flowing dress, decorated with retro ruffle and made of sheer material. There are a bunch of similar cheap dresses to choose from. To make this outfit warmer, throw a studded leather jacket over your shoulder and a relaxed autumn outfit is ready. My favorite autumn fashion piece is a warm, knitted sweater. There is nothing more cozy and comfortable, than sitting next to the person you love, watching spooky Halloween movies and wearing oversized sweater. Besides, cute sweaters are the perfect, simple finishing touch to any casual outfit. This season I feel like mixing colors and textures together, it can be challenging, but always looks stylish in the end. And what about shoes? Knee high brown boots, classic loafers and red cowboy boots are going to be trendy this autumn. I decided to stop on the most versatile option - knee-high velvet boots. They will look beautiful both with feminine sheer dress, casual autumn outfit and office suit.